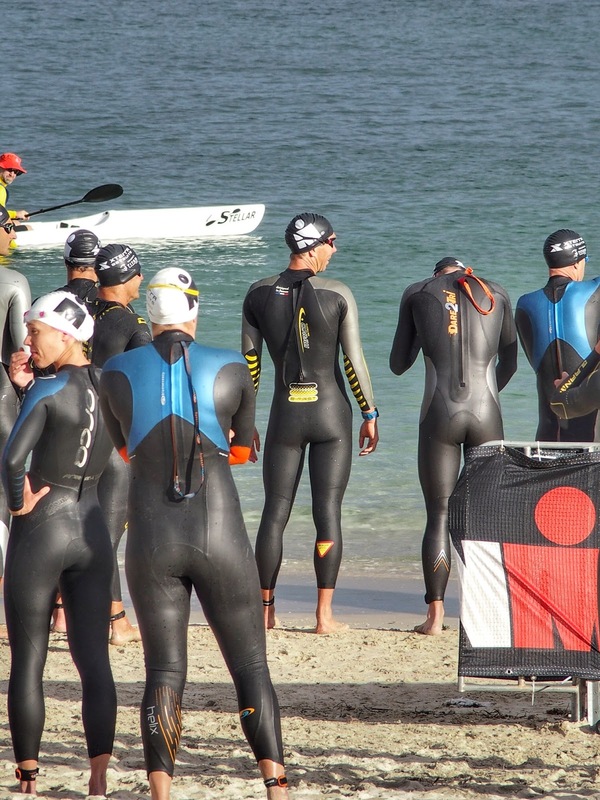 Two Brilliant Performances At Ironman Western Australia ~ Feel For The Water! Advice & Tips to Improve Your Swimming. 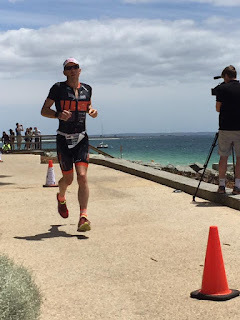 For the blog this week we've picked out two inspirational stories from the Busselton race from Derek Cross and Sharon Connolly who have both come back from major injury or health problems to have fantastic races. Derek smoked the 3.8km swim in sub 50 minutes (!) despite it feeling like "one of the easiest swims he's ever done". If you're an aspiring top age grouper, perhaps knocking on the door of being a pro, you'll want to know what it takes to swim like that and go on to a 8:42 finish. Derek spills the beans below! But perhaps even more impressively, Sharon completed a 12 year comeback from a serious illness to achieve her dream of completing an Ironman. Focusing in her report on how she built her confidence and fitness in the water whilst overcoming numerous setbacks, Sharon's sheer determination shines through. As you can read below, the result was a brilliant swim whilst having a bloody good time doing so - amazing! Both Derek and Sharon have been swimming the exact same training sessions that you can follow in the Swim Smooth Guru and our Waterproof Training Plans. Simple, effective swim coaching that works! You could say that the last 12 months of training and racing have been fairly bumpy ones for me. Almost exactly a year ago I crashed my bike after a race and tore the AC ligament in my right shoulder. 3 months, 3 surgeries and 1 plate followed to sort it out and during the entire time I couldn't swim a stroke. I watched my fitness disappear and my motivation struggle as I was forced to wonder numerous times whether I would ever race again. Not long after the plate was finally removed and I was given the okay to train again another bike crash resulted in a fracture to the radial head of my left elbow. 6 more weeks of no swimming were necessary to sort that out. I still remember the joy I felt when I finally took a full stroke with my left arm in May 2016 - at that point I hadn’t swum properly for about 6 months. At my first race back my skills were rusty and my confidence shaky, but I got through the race and had an alright day. My big take away from the race though was that I needed to swim quicker if I wanted to race in the pro category. After that I was determined to get quicker but the question was how. I know from experience that my swimming reacts well to volume. When I swim more I go faster, simple as that. It couldn't just be senseless kilometres though, I had to be smart, so I set up a new routine. • Monday was a solo swim with a session from the Swim Smooth Guru. Often a Pure Technique or a Tech/Endurance session, but sometimes a Red Mist if I was feeling good. • Wednesday was a Red Mist session with the Perth Squad. • Friday was a Threshold Session with the Perth Squad, followed up with a bit extra. This was a heavy session, often reaching over 6000m. Some Fridays I simply swam until I couldn’t. Tired arms not tired lungs as Aussie Coach Matt Koorey would say. • Weekend it was open water. My aim for this new routine was to hit at least 15km a week, pushing up towards 20km where I could. My mantra for all this became ‘do the work’. If there was a chance to be on the front of the lane, I took it. Wednesday’s sessions were a constant battle with motivation to get myself to the pool and do the work, but I got there every time. Once I was in the pool I was there until the end. Every time the alarm went off and I really wanted to stay in bed I would tell myself ‘do the work’ and get out the door. I have always said that I don’t have much sporting talent, but I am very, very stubborn. During this training I pushed that stubbornness to the limit. Fast forward a few months and I found myself standing on the Ironman WA start line. 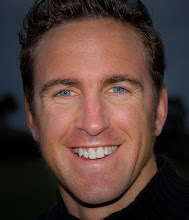 After following my swim routine for a few months I knew that my swimming was about the best it had ever been, particularly over sustained distance, however, I didn’t head into the race with any particular expectation. 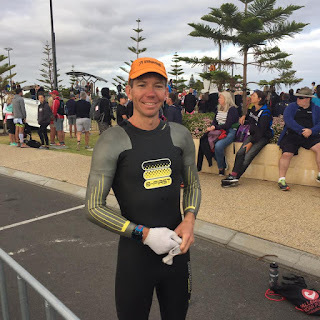 My goal was simply to relax, find a rhythm, pace it smart, find feet if I could and see how it went In the end that is more or less how the swim panned out. From the gun I was pleasantly surprised how sustainable the pace was. I am used to 70.3 racing where the first few hundred metres are a sprint but with the Ironman on the weekend the pace was more controlled. The slower start meant that I quickly found feet and was able to settle into my rhythm. 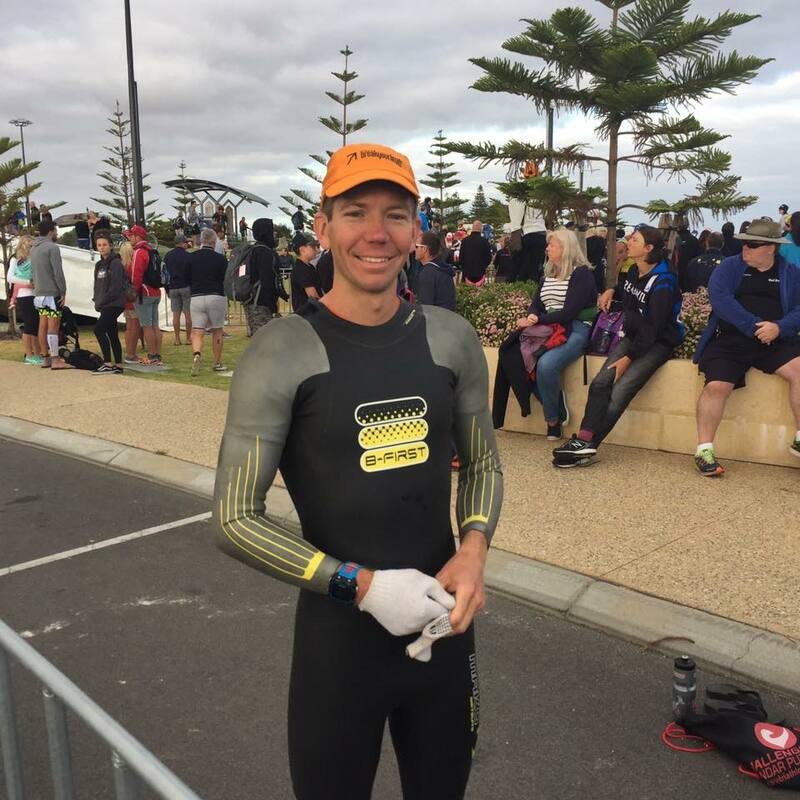 I have learned the hard way from Red Mist sessions how damaging it can be to go out too hard, too early and so for the first part of the swim I was content to sit in the pack, benefit from the slipstream and enjoy the moderate pace. I thought about pushing the pace but decided to conserve early and hold off until later. 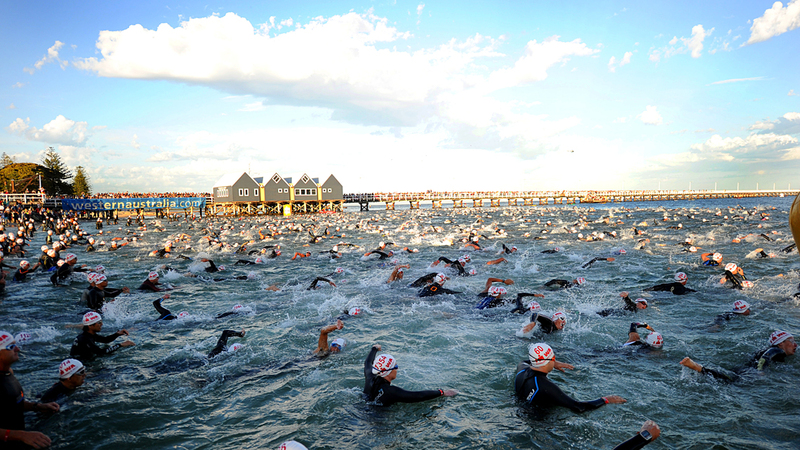 The swim at Ironman WA heads offshore for about a mile along one side of a huge jetty before you turn and swim back to shore along the other side of the jetty. A mile offshore there is usually some chop and so it was at Ironman WA on Sunday. The chop was particularly noticeable on the return to shore which was on the windward side of the jetty. As we turned around the end of the jetty we hit the chop proper and the pace of our group slowed. Due to the controlled pacing at the start of the swim I was still feeling really good, so when our group slowed down I thought I would jump to the front and do my bit to keep the pace up. The whole time I was swimming back into the chop I had a little Paul Newsome in my head telling me that you need to be comfortable breathing to both sides because sometimes you have to breath away from chop. I was never so happy that we spend time practicing ‘breathing to our least favourite side’. Slogging back into the chop is a tough way to spend a Sunday morning so I tried to focus on keeping the effort even and pace sustained. After fighting most of the way back to shore somebody came past with about 300m to go and took a turn at leading, letting me jump back into the slipstream and get a break. Not long after that we hit the shore and I realised we had been swimming at the front of the 2nd pack. I was pretty stoked later to find out that I had been 10th out of the water and had swum just under 50 minutes. What amazed me so much about the swim was that it had felt like one of the easiest swims I had ever done, which I largely put down to the conservative pacing early. 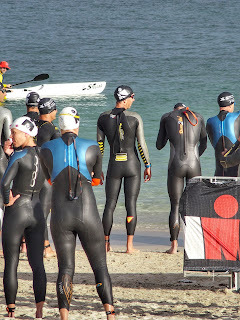 It was the beginning of what would be an awesome day for me at Ironman WA! Sharon Connolly - Start At the Beginning! Don't be afraid to start right where you are, or start over, just start at the beginning and move forward. In 2004 I had a major cardiac procedure and suffered a severe head, neck and back injury. Over the next few years I struggled with chronic nerve pain and a belief that this would be my life from now on, I became a victim of my injuries and they began to define me. In 2011 I was sick and tired of feeling sick and tired. I heard about an app called the "Couch 2 5K" I downloaded it and started right where I was - the beginning! The beginning was awful - I couldn't even run for a minute when that voice told me to "run now" without feeling like I was going to die! A minute and a half later she told me to "run now" again - this time I wanted to die! Daunted but determined I stuck with it and 8 weeks later I ran my first 5k non stop! A friend suggested I should do a triathlon - it sounded like the next challenge so I agreed to give it a go. The finer details of not owning a bike or having swum a lap for 20 years didn't stop me. Just under 4 weeks later I stumbled my way through my first triathlon - I loved and hated it at the same time. I loved doing it - I hated that I wasn't very good! However, I knew I could improve and I knew this was just the thing I needed in my life - challenges that I could overcome! I continued to train and work my way through the various distances and after completing my first 70.3 Half Ironman I dreamt of an Ironman finish when I turned 50. The limiting factor in all of this was the regular sidelining from various injuries - but I just kept starting over and often from the beginning. This year a recurring stress fracture in my tibia left me with 2 lots of 8 weeks without running - Ironman looked doubtful. My swim had always been average, often littered with panic attacks. I managed to get through each one but now it was time to work on it. Always hearing there "isn't much point as the small gains in time are better served getting quicker elsewhere." I had no choice as running was out of the question for now. How wrong this advice turned out to be! I kept hearing about Paul Newsome and Swim Smooth so I invested in a 1-on-1 analysis of my stroke. I worked through the swim Guru app and the drills. I joined the squad. To start with I was quite daunted and couldn't keep up. Everyone was so friendly and I felt so encouraged that I kept coming back and kept working hard. Slowly I began keeping up. Slowly I went from forcing my way through the water to feeling like I was sliding through it. In a way I can't explain I sometimes felt the water was helping me move through it - allowing me time to feel where my arms were, how my body was rotating and moving. I was breathing easily both sides now and I even had different paces! Who knew there was more than just one! Paul and I decided on the best pace for me for Ironman and I became the leader of my group. I was nicknamed "metronome" by them and I even looked forward to the Red Mist sessions now. We wanted an "intrinsic" pace for race day that would leave me feeling fresh for the 180k cycle and marathon ahead. Our aim was 2min/100m. Worried about the effect of the mass start and a panic attack in a training swim 2 days prior, Paul had calmed me by text. His words stayed with me on the day - bubble-bubble-breath! It's just another day at the office. The start was as expected - it's a Rugby match in a washing machine when 1500 other athletes all start together. A kick to the head sent my goggles flying but I had prepared for this and my double cap insurance policy paid off - I slid them back on from the top of my head and continued. I relaxed - I could feel the pull of the other swimmers and let the water take me. I could feel the water wanted to help me and the same as we go easy in warm up at squad I just kept going easy until the first buoy and some clear water. I settled into my stroke and just bubble-bubble-breathed my way around that jetty. 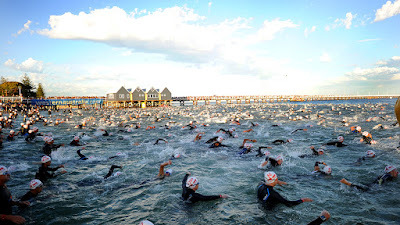 I had no idea of time - I was actually passing other swimmers on the way back to shore (this has never happened in the 3 other times around the jetty) I was loving every minute and a few squeals of delight joined my bubbles in the last 50 meters or so. I felt great and had had the perfect swim. I came out of the water in 1:16 - exactly as planned (2min/100m pace)! I had plenty more in the tank and I was set now for the day ahead. Just under 13 and 1/2 hrs later I heard the words: Sharon Connolly You are an Ironman! A dream come true! So, start at the beginning - start over as many times as you have to - start right now and go for it. Whatever your challenge is - whatever your dream is - go for it! Don't be limited by what you believe is possible - you can do anything you decide you can. Happy training!